Summary: Learn how to insulate a loft, calculate the quantity of insulating material, lay a vapour barrier, lay blanket insulation and lay loose-fill insulation. One of the ways to make substantial savings on your home heating bills is to insulate the loft. Not only can you save money on your heating bills, you may be eligible for a grant to carry out the work. Your local council or Citizens Advice Bureau will be able to provide you with the relevant information. The two most common forms of loft insulation are blanket insulation and loose-fill insulation. Blanket insulation is made from glass fibre, mineral fibre or rock fibre and is sold in large rolls. All three materials are non-flammable and will have been treated against vermin, damp and rot. The rolls of insulating material are usually 6 - 8m long (20 - 25ft) and up to 400mm wide (16in). The thickness of the material can be 100, 150 or 200mm (4, 6 or 8in), but the thicker the insulation the less heat will be lost. The rolls of insulating material are usually unbacked but can come with a paper backing to prevent tearing of the fibre or a foil backing. Rolls of blanket insulation with a foil backing are used when a vapour barrier is required. Warm moist air from heated rooms will travel to cold unheated areas such as lofts, producing condensation. Over time this will reduce the effectiveness of the insulation and may even cause dry rot in the roof beams. A vapour barrier is used to prevent this. The foil backing laid against the warm side of the insulation creates a barrier preventing the warm moist air passing into the loft. Rolls of polythene backed insulation material are also available and will serve the same purpose. The most common forms of loose-fill insulation are exfoliated vermiculite and mineral fibre. Loose-fill insulation material is supplied in bags, which will cover an area of approximately 1 m2. Modern loose-fill insulation material is very light so it's not recommended for loft spaces that are extremely draughty as it will get blown about in high winds, reducing its effectiveness. When insulating a loft, remember that blanket insulation materials and loose-fill materials can cause discomfort. Although extremely effective for insulation, when glass fibre, mineral fibre and rock fibre comes into contact with the skin it can cause an unpleasant irritation; therefore it is advisable to wear a long-sleeve shirt, long trousers (not shorts) and thick work gloves. To avoid inhaling the dust from loose-fill materials or the fibres from blanket insulation materials always wear a disposable dust mask. Ensure there is adequate lighting in the loft to carry out the job. Before laying the insulating material sweep the areas between the ceiling joists and remove the debris. Then seal all gaps around vents, pipes and wiring entering the loft using flexible mastic. To calculate the amount of insulation you need multiply the length of your house by its width. This area may need to be increased depending on the thickness of the blanket material you are using and the current Building Regulations recommendation for the thickness of loft insulation. The average ceiling joist in modern houses is only around 100 mm deep (4 ins), so to meet current Building Regulations it may be necessary to increase the depth of the material by adding another blanket layer on top of the first but at right angles to it. If you are using rolls of unbacked blanket insulation, a vapour barrier is required. To create a vapour barrier between the joists you have a choice of two materials: foil-backed building paper or polythene sheeting. 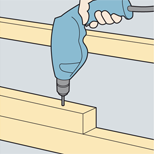 Whichever material you use, cut it 50 - 75mm (2 - 3in) wider than the gap between the joists to allow the edges to curl up the sides of the joists to prevent any gaps. When using foil-backed building paper it must be laid foil side down. To join two lengths of paper together, make an overlap and stick down with masking tape. 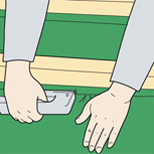 A vapour barrier made from Polythene sheeting should be laid out between the joists and stapled to the sides of the joists using a staple gun. Although foil backed and polythene backed material is more expensive you will not have to lay a separate vapour barrier, therefore saving time. To lay the vapour barrier and the insulation, it is best to work from a sturdy board placed across the joists. 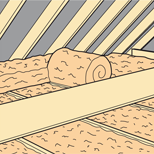 A polythene sheeting vapour barrier should be stapled to the sides of the joists. It is easier to remove the wrapping from the rolls in the loft, as the material is compressed for transportation and expands when unwrapped. Starting at one end of the loft begin to rollout the blanket between the joists, but ensure there is a gap of about 50mm (2in) from the eaves to allow air to circulate. This will help prevent condensation. Press the blanket down lightly as you move across the loft but avoid compressing it. On reaching the opposite end of the loft cut the material with large scissors, remembering to leave a 50mm gap (2in) from the eaves. When one roll finishes, begin another by butting the two ends together, making sure there are no gaps. Avoid covering loose electric cables as they could overheat: push the material underneath them or where possible fix them to the joists. To prevent an electrical fitting from overheating, cut a hole in the insulation to allow for the fitting. When encountering pipes the material must be cut tightly around them. Never lay the insulation material under the cold water tank, as the warm air from below prevents the water freezing. Repeat the process between all the other joists. If regulations require the insulation to be a certain depth, apply a second layer at right angles to the first. Before laying loose-fill insulation, you need to create a barrier to maintain a gap of about 50mm (2in) from the eaves to allow air to circulate. This can be achieved by wedging pieces of plywood between the joists. Furthermore, if the depth of the ceiling joists is shallow it will be necessary to nail lengths of timber to the top of the joists to increase the depth to conform to current Building Regulations. 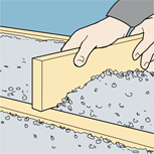 Pour the loose-fill insulation directly from the bag into the space between the joists. Cut a piece of straight edged timber a little longer than the gap between the joists to use as a spreader and working backwards level the insulating material. Continue the process until all the gaps between the joists are filled. As with blanket insulation, do not lay loose-fill material under the cold water tank. Wedge pieces of plywood between joists to maintain a gap of 50mm from the eaves for ventilation. If the depth of the ceiling joists is too shallow for Building Regulations, nail lengths of timber to the top of the joists to increase the depth. Use a piece of straight edged timber as a spreader and working backwards level the insulating material. There are two types of insulating material designed for this job: blanket insulation and semi-rigid fibre insulation batts. Another factor to consider is condensation caused by the underside of the tiles becoming very cold. 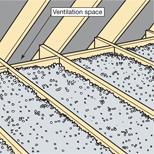 This problem can be overcome by providing adequate ventilation.